This paper presents a survey of the literature covering the more significant papers about the Gaspee uncovered to date and the more general ship construction and rigging practices of the mid-eighteenth century. 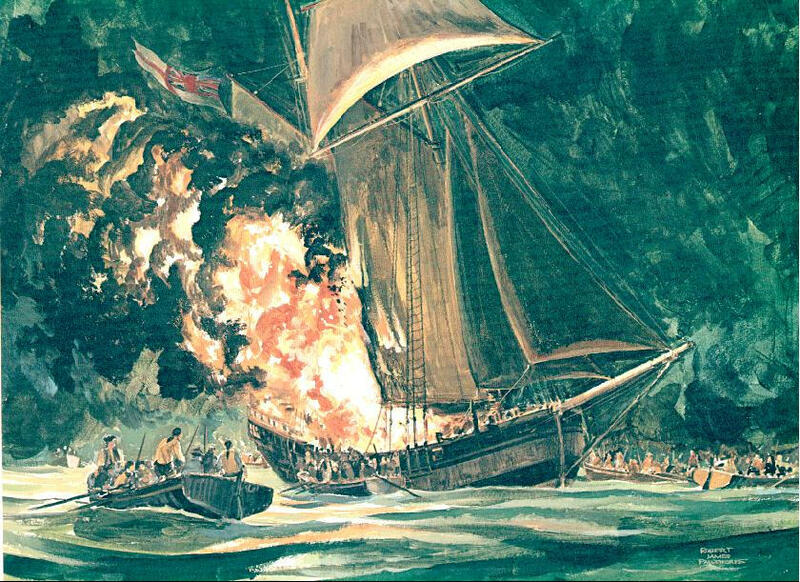 I have attempted to synthesize the available information and draw my own conclusions about what can be determined today about the actual construction and rigging of the Gaspee as of the time of her burning in Narragansett Bay. "In January 1764, the Admiralty began buying schooners for service mostly along the New England coast…Hence, the Admiralty ordered the Navy Board to obtain six "Marblehead schooners or sloops" to be named Chaleur, Gaspee, Hope, Magdalen, St. John, and St. Lawrence…." The Navy List shows these vessels to have been nearly alike in size: Magdalen 90 3/94; Gaspee, 102 44/94; Hope, 105 40/94; St. John and St. Lawrence 114 65/94 and Chaleur 116 91/94. Chaleur is the only one of these vessels for which Admiralty draughts are known to exist. The name "Marblehead" is generally accepted today as indicative of vessels built only in Essex County, Massachusetts. Chapelle and others indicate that this definition was also true during the eighteenth century. The Admiralty papers, as reported by Chapelle, reference "Essex" as one of two areas on the North American coast that were recognized as centers for building fast sailing vessels. Hahn, on the other hand suggests that to the Admiralty and their purchasing agent Colville, a looser definition was in operation. Hahn presents much of a long letter from Admiral Colville, writing from Halifax Harbor, to Philip Stephens, Secretary of the Admiralty detailing the progress in acquiring "six Marblehead Schooners or Sloops". I quote in part "on the 27 Directions were sent to Boston, by the Naval Officer, for purchasing three of the best Marblehead Schooners or Sloops, from Seventy to ninety Tones that could be procured, to be delivered at this Place." In a later letter, Colville identifies the three as Magdalen, Schooner, 90 3/94 tons; Chaleur, Sloop, 116 91/94 tons; and St. John, Schooner, tonnage unknown. Further in Colville's letter, he goes on to say "Besides these, two Schooners were purchased at this Place which are now fitting out, at the Yard, in the manner directed by their Lordships: They are very fine Vessels between Ninety and a hundred Tons each; one of them was built last Fall at a new Settlement of this Province called Chester, twelve Leagues to the Westward of Halifax… I expect another Schooner that is ready to be launched at the same Place which will compleat [sic] the number of six. In the later letter, he identifies these vessels as; Hope, Schooner, 105 40/94 tons; St. Lawrence, Schooner, 114 65/94; and Gaspey [sic], Sloop, 102 44/94. From Colville's letter we then have three vessels, not including the Gaspee, which were purchased at Boston, where they were built unknown. We also have three vessels, including the Gaspee, which were purchased at Halifax. One of them is not identified to her place of building. One of them positively identified as being "built" at Chester which was probably Hope since her age was given as 9 months. There is a strong suggestion that a third vessel is being built at Chester as opposed to just going through a refit, by the comment "I expect another Schooner that is ready to be launched at the same Place which will compleat [sic] the number of six". Of the vessels procured in Halifax, Colville already had two in hand at the time of writing the letter and was waiting for the third. In his letter, Colville states “this is the worst time of the year for buying such Vessels, as most of them are fitted out for the Summer’s Fishing when that Season is over they become plenty and cheap”. In his final tabulation of vessels purchased at Halifax, Colville had two schooners and a sloop, not the three schooners he had originally reported. The Gaspee was reported as the "sloop" and her age of 1 year 7 months prohibits her consideration as being the vessel that was under construction at the time the first letter was written. Evidently, Colville bought a different vessel rather than wait for the one that was not yet launched. What we are left with is six vessels that were built between 1761 and 1764 somewhere between Halifax and Boston, give or take a few miles further north or south, that in the eye of Admiral Colville and his aids fit the description "Marblehead schooner or sloop". Reliable draughts exist only for the Chaleur out of the six ships in question. Draughts are also available for two ships of the same period, the Halifax and the Sultana. The only extant dimensions recorded for the Gaspee are her tonnage (102 44/94), length of keel (49), extreme breadth (19’ 10”) and depth of hold (7’ 10”). Smith and Gilmer estimate the length on the keel to be 46-52 feet, LOA 63-68 and beam 19-21 for a vessel of 100 tons. Although the Gaspee dimensions compare favorably to the estimates, the estimates represent a composite of the known hull forms of the period. Knowing exact dimensions does not give an indication of the hull form without comparison to other vessels. The following table shows the dimensions to Gaspee, Chaleur, Halifax and Sultana. Left: The lines and outboard profile of the Halifax, (misspelt as Hallifax on this draught) an American-built commercial schooner c1765. The plan shows a small and rather slow carrier. Note the fullness of the waterlines and buttocks at bow and stern. From Chapelle's The History of American Sailing Ships, p34-35. Click to enlarge images. Right: Halifax, upper portion shows the outboard profile of this schooner as altered for the Royal Navy. 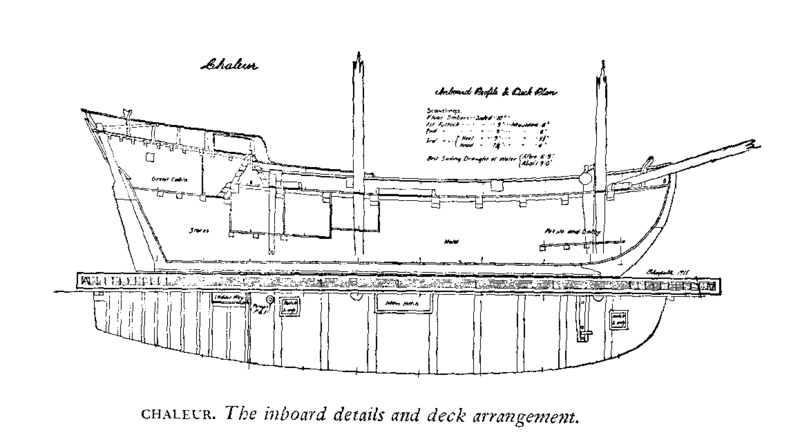 The lower portion shows the inboard details of the schooner before the alterations were made in her rails. Note the method of fitting the hawse-holes below deck level, an item of construction rarely seen in the period in which this schooner was built. The Gaspee compares favorably to the Chaleur and is not too far off from the Halifax. Either of these vessels are candidates for possible Gaspee hull shapes. 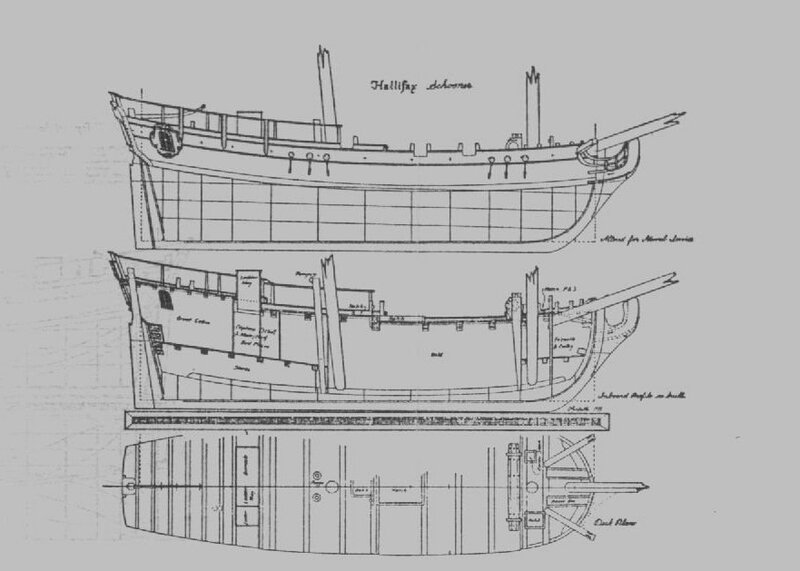 Because of the relationship between size and hold capacity, the Sultana is unlikely to provide insights into the shape of the Gaspee’s hull. In addition to the Chaleur and Halifax drawings, there are extant wrecks of vessels similar in size from the same period. The wrecks exhibit similarities to Chaleur but also exhibit differences that are significant to the actual shape of the hulls. In some instances, the evident similarities to Chaleur may be a consequence of the archaeologists using the Chaleur draughts to lay out their survey grid as was done with the Terrence Bay Wreck. Taken together, the available evidence leaves a wide variety of possible hull shapes for the Gaspee. Some insights into selecting an appropriate hull shape could be gained if it could be determined the purpose for which the Gaspee was built. Each purpose (e.g., fishing, merchant, transport, privateer and so forth) tends to favor particular design characteristics. Prior to the eighteenth century, hull design was general in nature and ships were built with no particular purpose implied in their design. During the eighteenth century, more attention was paid in the design toward a particular occupation, but even then, many vessels served in more than one occupation. Coleville’s letter gives the information that most of the vessels procured were “fitted out for the Summer’s fishing” which implies that in 1763 vessels were still being fitted out differently for different occupations during different seasons. Chapelle suggests that Chaleur was built as both a merchant and a fishing vessel, a common combination from the period. Gaspee may have been similarly employed and the economic conditions of the time favor that conclusion. One significant clue both Hahn and Morris offer is that in the colonies during that period, the terms “sloop” and “schooner” were most likely references to particular hull forms rather than rigging. Morris quotes Blanckley (1750) as follows: “Sloops are sailed and masted as Men’s Fancies lead them, sometimes with one Mast, with two, and with three, with Bermudoes, Shoulder of Mutton, Square, Lugg, and Smack Sails; they are in Figure either square or round Stern’d.” Morris further elaborates the issue by stating “three names [in American usage], sloop, ketch and schooner, do after about 1700 carry with them a moderately clear association with particular rigs.” Of the six vessels purchased by Colville, only the Chaleur and Gaspee are identified as sloops however, there is no evidence suggesting the context (hull form or rig) that Colville used in identifying the vessel types at the time of their purchase. There is evidence that their rigs were changed from sloop to schooner rigs at some time after being brought into the navy so at least the context of rig may be assumed. An additional clue is given in Morris in his identification of vessels owed at Newport, Rhode Island in 1764 from the Itineraries of President Ezra Stiles of Yale College. At that time, there were 50 sloops of average tonnage 60 and 7 schooners of average tonnage 45. This suggests that for vessels large enough to be noted, sloops were as a class, larger than schooners. Morris also presents statistics from Philadelphia from the 1730 Foreign Documents that show the same characteristics. Unfortunately, all six of the vessels purchased by Colville are of approximately the same tonnage. Gaspee and Chaleur were built within eight months of each other. This is too short a period for substantial changes in ship building technology to have come into play. Some variation in hulls built from the same design can be expected, particularly if they were built in different yards, but significant variation from type are unlikely. There is no direct evidence that Gaspee and Chaleur were of the same design. Gaspee and Chaleur were approximately the same size, proportions and tonnage. Size and proportions do not exclude the possibility of extreme differences in hull form, particularly below the water line, but nearly equivalent tonnage limits the variation significantly. Gaspee and Chaleur were both identified as sloops while the other four were identified as schooners. Gaspee and Chaleur are known to have been sloop rigged at the time of purchase. Colville, in identifying the types of vessels he purchased, may have been referring to the hull form, the rig or both. Conclusion: Only the barest of threads, the definition of sloop used by Colville in identifying the types of vessels he purchased, connects the design of the Gaspee to the design of Chaleur. Colville’s definition in this context is unknown. Without further evidence, the hull form of the Gaspee cannot be determined definitively. Two aspects of a vessel define what she looks like to the casual observer, her rig and what she looks like above the load waterline. The characteristics of her look above the waterline include her poop deck, quarterdeck, bulwarks, rails and the type and placement of the deck furniture and armament. The unfortunate reality is that for vessels of this period of the size of the Gaspee, there is a wide range of possible variation in these characteristics. The oldest extant artistic representations of the Gaspee depict a somewhat oval transom that exaggerates the curve of the tumblehome. Vessels from the same period that have a poop deck typically have a change in shape in the transom that becomes more vertical from the stern view as it transitions over the end of the poop deck. This transition does not appear in the oldest artistic representations of the Gaspee and suggests that she did not have a poop deck. Note that the term “poop deck” was often confused with the term “quarterdeck” during the period. In this discussion, I use the term “poop deck” to mean an additional deck in the stern, above the quarterdeck. Contemporary artists were the “photographers” of their day. Contemporary artists could no more misrepresent a ship than they could a house or a horse and still stay in business. Contemporary artistic representations of ships may be lacking in small detail, but in major features may be relied upon. None of the oldest extant artistic representations of Gaspee have been proven to be contemporaneous. Non-contemporaneous artistic representations tend to be less accurate, the more so as they become further removed in time. Non-contemporaneous artistic representations may have been intended to emphasize some aspect of an event other than the vessel involved and to do so in a manner that increases the perception of degree of difficulty of the event or the relative importance of the participants. The oldest known artistic representations agree on major features of Gaspee to a significant degree although it is possible that they are all reproductions in various forms of a single, undated woodcut. Conclusion: The oldest known artistic representations suggest that Gaspee did not have had a poop deck. Quarterdeck height ranged from mid-shin height to waist height on vessels of the size of the Gaspee. In length, they varied from mid-way between the stern and the mainmast to just forward of the mast. Extant artistic representations give some indication of the height of the Gaspee’s quarterdeck. 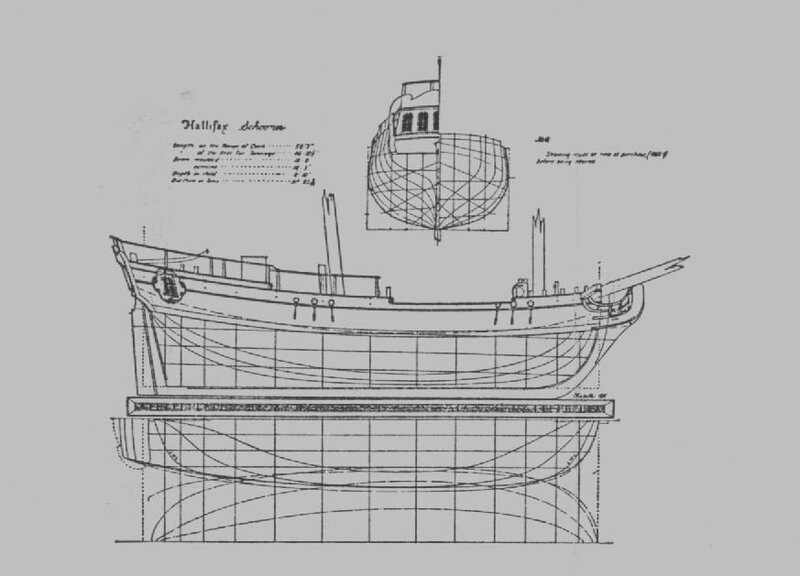 An old woodcut (provenance and exact age unknown but older than 1856) shows the rounded top to the transom as shown on the plans of the Chaleur which is known from the Admiralty draughts to have a high quarterdeck. The people depicted standing on the quarterdeck are shown well above the waterline also indicating a high quarterdeck. Hale reproduces a steel engraving by J. Rogers which was published in 1856. The engraving was identified as "after a painting by J. McNevin, from the Rhode Island Historical Society. The engraving shows the stern view with marked tumblehome, three widely spaced stern lights and men standing on the cabin top. The line of the cabin top appears slightly rounded. The length was most likely less than the distance between the stern and the mainmast since she was brought into the British Navy as a warship. A longer quarterdeck would have interfered with the placement of carriage guns and would be an unlikely choice. A high quarterdeck is more suitable to providing adequate headroom in the officer’s quarters. Conclusion: The Gaspee probably had a high quarterdeck that extended somewhere between one-half and three quarters of the way between the stern and midship. Most merchant vessels of the period had no true bulwarks in the waist but rather had bulwarks less than a foot in height. The quarterdeck and sometimes the forward end of the vessel were edged with a railing. Fishing vessels, since men fished over the side, typically had a bulwark in the waist. Small warships sometimes had half-height bulwarks with notches for the guns similar to the crenellations on a medieval castle. Others had bulwarks high enough to support the installation of true gun ports. Bulwarks provide purchase points for gun tackles. Bulwarks provide a psychological benefit to the gun crews. The Chaleur is shown with full height bulwarks in the Admiralty draughts. Conclusion: The Gaspee probably had bulwarks of significant height in the waist after being refitted for use by the Royal Navy. Deck furniture provides support for various activities on the deck such as piloting the vessel, hoisting cargo, sails and anchors and access to the below deck areas. For any given function, the form and location of the item could vary, but with some limitations. The companionway for the aft cabin was unlikely to be mounted in the bow or the mechanism for hoisting the anchor located in the stern. For a vessel the size of the Gaspee, there were some choices that were likely to be preferable to others as indicated below. The rudder was probably controlled by a tiller, well aft, rather than a wheel. Wheels of the time tended to have significant play and took up more room than a tiller alone. Unless a vessel required significantly more mechanical advantage than offered by a tiller of reasonable length to hold a point of sail, a wheel was impractical. There was probably a windlass, rather than a capstain, mounted well forward. It was probably mounted just abaft the foremast. A capstan was probably not used due to its requirement for more space to operate than is needed for a windlass. A large main hatch was probably just forward of the mainmast. A means of accessing the hold were required regardless the occupation of the vessel. A centrally located hatch would give equal access to all parts of the hold. A companionway to the cabin was probably installed just aft of the forward edge of the poop deck. The captain of a vessel needed to be provided with ready access to the deck from the cabin, particularly in times of imminent danger to the vessel. That access isn’t likely to have been positioned such that it encroached on the available cabin space. A binnacle was probably just abaft the cabin companionway and forward of the forward end of the tiller. The compass needed to be readily visible to the man at the helm. There may have been a cable locker hatch on one or both sides of the bowsprit. Except in very small vessels, cables were stored below deck. At least one cable locker is needed. Two is more likely since a vessel of 100 tons most likely carried a backup anchor. There were likely to have been one or two elm tree pumps mounted just forward of or on the quarterdeck. Ships leak. Some means of removing water from the bilge was needed. Most vessels of the period had a bilge that was lower in the stern than in the bow. Simple elm tree pumps are most likely for vessels of the size of the Gaspee. Conclusion: The generalities unfortunately, do not give much insight into the details. The companionway into the cabin may have been no more than a sliding hatch mounted on the forward end of the quarterdeck. It may have been a deckhouse mounted somewhere between the tiller and the forward end of the quarterdeck. The binnacle may have been a separate structure or may have been attached to the aft side of a deckhouse depending on the configuration of the companionway. The literature indicates that exact placement, shape and size of the deck furniture was somewhat subject to the whims of the builder during construction or refit and afterwards, to the whims of the captain. There is no reason to suspect that the deck furniture differed in kind from the generalities, but there is too much variation possible in actual form to determine what it looked like on the Gaspee. Bacon reports the Gaspee as a "schooner of eight guns" but gives no attribution or indication of their size. Colville’s letter of 19 May 1764 states that he had commanded the frigate captains to turn over their 3-pounders and part of their swivels for use on the schooners. Hahn further elaborates that the difficulty the schooners had in dealing with the smugglers was at least in part due to their light (3-pounder) armament. Dudingston claimed at his court martial that he could not train his guns on the attackers because they were too close to the Gaspee when noticed. This suggests that the Gaspee was not equipped with swivel guns since they can be depressed to fire almost vertically. However, Colville’s letter of 19 May 1764 included swivel guns. Colville’s letter gives explicit reference to the size of carriage guns for the Gaspee. Eight guns, mounted in the waist is reasonable for a vessel the size of the Gaspee. Guns were hard to come by on station. Eight guns may have been desirable, but there might not have been enough available to meet that goal. Duddingston’s claim of an inability to train guns on the attackers should not be interpreted to indicate the lack of swivel guns but rather as an attempt by Dudingston to provide a possible explanation for an apparent lack of readiness on the part of his officers and crew. Six to eight 3-pounder guns is a reasonable estimate for the carriage gun armament of the Gaspee. The carriage guns were most likely mounted in the waist. She was most likely also armed with swivel guns mounted on the rail of the quarterdeck and possibly at the bow. On the issue of whether "schooner", in reference to rig, meant the same then as it does now, Morris suggests that at least for Colonial America, it did, at least in its reference to the number of masts involved. He claims that the distinction of schooners having two masts and sloops having one was well part of the local lexicon by mid century. The oldest extant artistic representations of the Gaspee as of the time of her burning show her as schooner rigged. The oldest artistic representations of the Gaspee show her as carrying a fore-and-aft sail on both the main and fore masts and a jib. A square sail mounted on a spar crossed on the foremast is also shown. There is no spar shown on the main mast. None of the older artistic representations show a spar crossed on the mainmast. Both the old woodcut and the later picture by Charles DeWolfe Brownell (1892) show true topmasts for both the fore and main masts rather than pole masts. The topmasts appear to have been intended to support staysails rather than topsails since no yards are shown. This may however be no more than the particular rig chosen by Dudingston while cruising Narragansett Bay. Topsail yards were often struck when a topsail was not needed to meet the sailing conditions at a particular point in time. Staysails, in light airs, are more useful in the general sailing conditions of Narragansett Bay than topsails. May reports testimony to the effect that "One of the boats came alongside under the starboard fore shrouds". The existence of shrouds, both fore and aft, are to be expected in a vessel of this type and period. The Gaspee was purchased into the British navy as a sloop that was later converted to a schooner. This is a reasonable conversion for the period, particularly when there was inadequate crew for the vessel. Sloops require a larger crew than do schooners of the same size due to a sloop having a single, very large mainsail in comparison to the schooner’s smaller fore and main sails. Coleville indicated in his letter to the Admiralty that he was having difficulty obtaining an adequate number of skilled seamen to man the fleet. The references to the Gaspee being a schooner describe a vessel whose rig falls within the parameters established by the oldest known artistic representations. All references to the Gaspee, at the time of her burning refer to her as a schooner. The term schooner, as applied to rig, was at the time equivalent to the usage of the term today. The basic schooner rig supports a fairly broad set of optional sail plan configurations depending on the prevailing weather conditions. All reasonable artistic representations of the Gaspee depict a schooner rig. 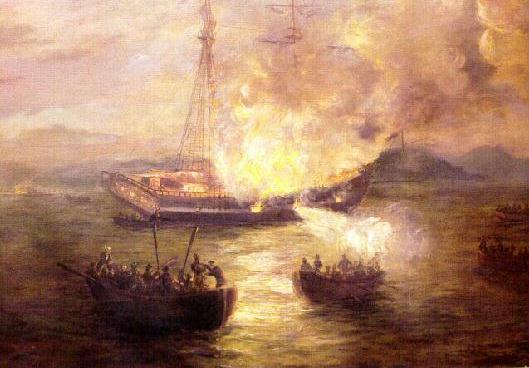 The oldest artistic representations are probably a reasonable estimate of the rigging configuration of the Gaspee at the time of her burning. The configuration, at the time of her burning, does not preclude other configurations she might have carried at other times, that still remain within the definition of schooner as applied during the period. Some reasonable assumptions may be drawn from the available documentation about the Gaspee’s construction and rigging. These are however limited to her rig, armament and generalities about all other aspects of the vessel. The exact hull form of the Gaspee has been lost to history, as have most of the details of her appearance. There are too many gaps in what is known to be able to definitively describe the Gaspee to the degree necessary to build a truly representative model or reconstruction. Biddle, Randle M, Personal correspondence with the author. Smith, Melbourne and Gilmer, Thomas C, “The Colonial Brig Peggy Stewart”, Nautical Research Journal, Volume 19, No. 4. Note: Only the oldest provenance sources are considered. More modern renditions deemed by the author to be too fanciful for colonial built vessels, even after refit for the British Navy, have not been considered. Also dropped from consideration are those that lack sufficient detail to be of use. 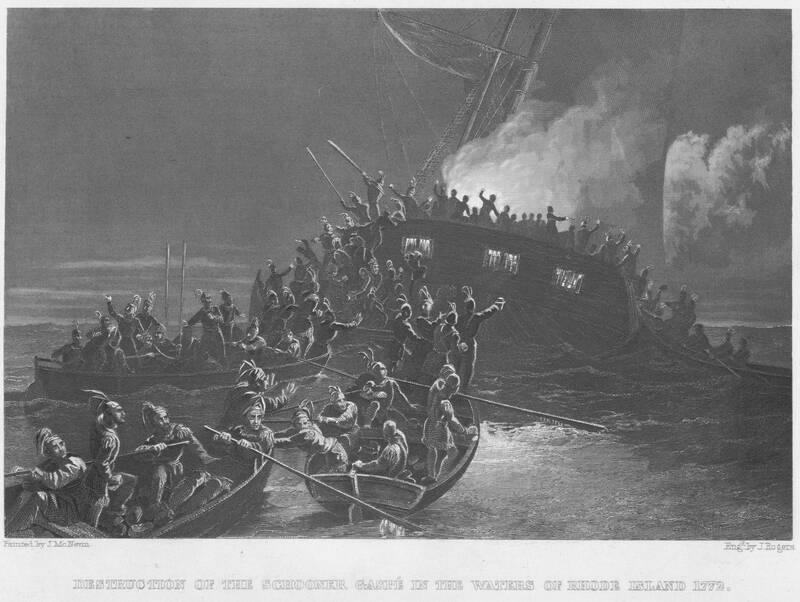 Burning of the Gaspee – Old Woodcarving (date unknown). Stern view of the Gaspee. Charles DeWolfe Brownell – Painting 1892. Starboard slightly abaft beam view. Robert James Pailthorpe – Painting from old print owned by Hazel Wade Kennedy – Starboard bow view. J. McKevin – Woodcut c1872.